Holding this pen in your mouth and breathing in allows you to project a thick cloud of vapor, but don’t worry it’s not tobacco. As a bonus action, you can blow this vapor out in a 15-foot cone or a 30-foot line where it lingers for one minute or until it’s blown away. Any creature in the vapor cannot see beyond five feet in front of them. 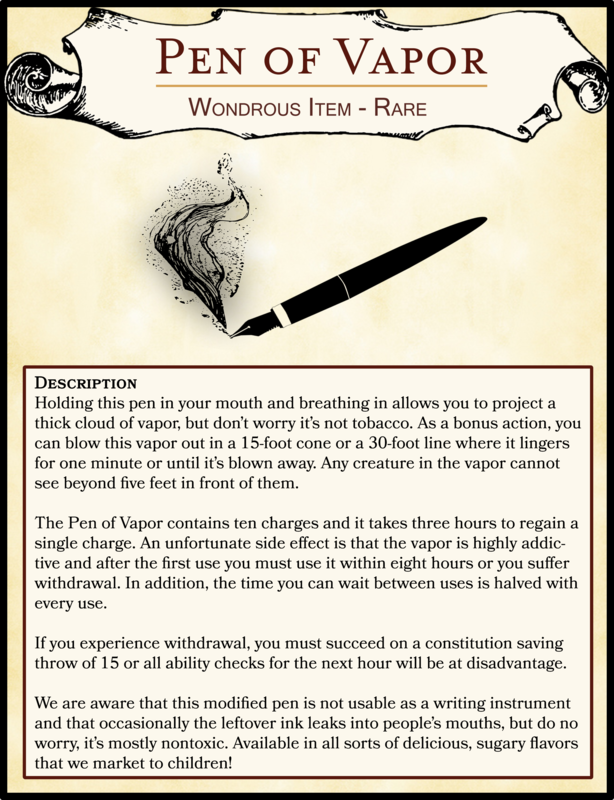 The Pen of Vapor contains ten charges and it takes three hours to regain a single charge. An unfortunate side effect is that the vapor is highly addictive and after the first use you must use it within eight hours or you suffer withdrawal. In addition, the time you can wait between uses is halved with every use. If you experience withdrawal, you must succeed on a constitution saving throw of 15 or all ability checks for the next hour will be at disadvantage. We are aware that this modified pen is not usable as a writing instrument and that occasionally the leftover ink leaks into people’s mouths, but do no worry, it’s mostly nontoxic. Available in all sorts of delicious, sugary flavors that we market to children!